Institute striker Garbhán Friel is starting to find his feet and has scored three goals in his last two games, much to boss Kevin Deery’s delight. A powerful and fit Friel could be a key to any success the Drumahoe side have over the coming months. “When Garbhán is driving through the middle, people think he isn’t quick, but I have watched him in training and he has a good turn of foot,” he said. 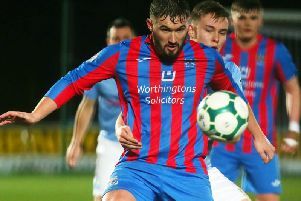 The Stute boss was also full of praise for goalkeeper Martin Gallagher, who secured the club’s first clean-sheet in the league this campaign. “I class Marty as part of our back-four, he’s so comfortable on the ball and it’s a great option, he’s like an extra man for us if you want to play out from the back. “His distribution was super and although he didn’t have much to do in terms of saves, whenever he was called upon he did well with a few shots and dealt with crosses coming into the box and Darryl (McDermott) and Stephen (O’Donnell) defended very well throughout.